Join Embarcadero's Product Management team for this first look webinar to see how you can use the upcoming version of RAD Studio, Delphi and C++Builder to build and update data-rich, hyper connected, visually engaging applications for Windows 10, Mac, Mobile and IoT. 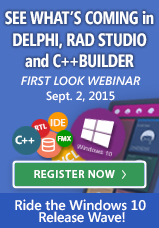 In this webinar, you will learn about new innovations for RAD Studio, Delphi and C++Builder developers! Register Now! "The overall vision of where RAD Studio is going is awesome!"